Native advertising is increasingly entering into the conversations of today's digital marketers. It is defined as an advertising unit designed to integrate seamlessly with a user's consumption experience. It is taking shape in the form of Sponsored Stories on Facebook, promoted content on Buzzfeed, and Paid Discovery on StumbleUpon, to name a few. Marketers are scrambling to better understand how to take advantage of this "new" form of advertising, yet they neglect to relate these platforms to their predecessors. Native advertising isn't new. It has been around for more than a century, though it has evolved into more personal applications as time has passed. In today's digital world, we are hungry for brand interactions that are meaningful and turn into viral distribution. This is no different than the pioneers who built native advertising. 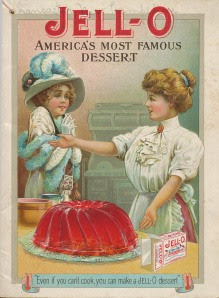 The brand that started the native advertising movement was Jell-O in the early 1900s. While heavily investing in the "traditional" media of the time, the flavored gelatin set itself apart by capturing a then non-traditional medium: the cookbook. Jell-O created 15 million recipe books highlighting celebrities' favorite gelatin concoctions, issued for free by salesmen across the country. The brand used these cookbooks to enhance the value of the consumer's desire to entertain, providing them with a means to an end while using the brand as the catalyst to reach that end. The consumer was placed at the center of the brand experience, and Jell-O reaped the benefits. Within five years of the native advertising movement, Jell-O doubled its sales by tapping into consumers' desire to entertain in an emerging ecosystem in America. Regardless of the decade you are in, that's a result that will make your CEO happy. Jell-O proved that creating a non-interruptive brand experience could guide sales. The challenge of reaching scale via salesmen, however, limited the reach with which Jell-O could thrive. Procter & Gamble evolved that strategy with a move into media that set the stage for today's digital landscape. In the 1940s, homemakers in the U.S. were increasingly listening to daytime programming while they engaged with their day. You have heard of "Guiding Light;" you have heard of "As the World Turns," but have you heard that it was P&G that produced the beginnings of these soap operas? Incorporated in 1949, Procter & Gamble Entertainment is "focused on creating original content that enables the company to connect with consumers and advertise its brands." You read that correctly: 1949. Over the past 60-plus years, P&G has produced more than 20 different content programs for radio and TV that served as native advertising experience. Didn't know that the brand that brought you Tide and Pampers also brought you 54 years of plot twists and backstabbing while watching the world turn? That's exactly the beauty of native advertising. It's organic. It's in line with what you expect when you're looking to kick back and enjoy a good story. Native advertising highlights your brand in a native context: A main character does laundry, uses Tide, and has the cleanest white sheets -- the perfect solution for a perfect house. The show itself built an object around which consumers could ignite a conversation, opening the potential to discuss the brands featured in the previous episodes. "As the World Turns" was cancelled in 2010, marking the end of an era for exclusively producing content for TV. This opened the door for the new wave of native advertising: original digital programming. In the age of digital, you no longer need to provide 30 to 60 minutes worth of content consumption to create a platform for your message -- that was the expectation of TV viewers. In the age of digital, you need to be crisp, but as always, you must enhance the experience of consuming the content your brand is creating. Smell like a man, man. In five words, Old Spice was able to place online native advertising on the map. All it took was 100 million views. While the campaign began as a TV spot, the true beauty of it embracing a native form was when it combined with social media power. Old Spice (a P&G brand) found that its TV spot was not only getting views on YouTube, but it was being parodied! The viral distribution that advertisers spent years trying to perfect, word-of-mouth, was permeating online in the form of emails, "likes," and tweets. As masters of native advertising, P&G found the ideal transformation to online. For three days in July 2010, a team of creative writers from Wieden + Kennedy locked themselves in a bathroom with the "Old Spice Guy" and called on users across the globe to tweet their questions and get them answered. P&G empowered the everyday internet user to tweet to Old Spice, and the lucky ones received a response. Old Spice bridged the gap that was created over previous decades: It combined massive scale with a personal touch. Imagine what your social feeds looked like on that day -- your friends actively reaching out to the Old Spice brand in a way that was native to the platform. It wasn't "hey, if you sign up for this coupon, I get one too." It was "Old Spice is such a fun brand, and I want in." The results of the campaign were similar to Jell-O's. Sales for the month of July doubled. While critics will say that you cannot directly attribute the success to one campaign, the native implementation has reached more than 1.2 billion people and continues to live on. First mover advantage cannot be discounted either, though the promise in destination-based marketing is proving to be a unique evolution. Distribution technologies like Facebook, Twitter, and StumbleUpon, and evolving media platforms like BuzzFeed, are helping creatives blossom, providing them with an inherently built-in, personal recommendation network. The opportunity created for brands becomes destination-based marketing, proving to become a powerful source for personal engagement matched with viral distribution. Tapping into the mentality of Facebook users, rather than just trying to target them, Intel built a personalized three-minute video for each person that engaged with it. Combining your friends, photos, and content, the Museum of Me captured 1 million people within five days of its launch last June. "At Intel, we subscribe to the philosophy that brands must be storytellers. As part of our media and marketing activities, we've chosen key opportunities to tell our brand story through experiences for our audience, brought to you by Intel," said David Veneski, U.S. media director for Intel. The Museum of Me experience might have been powered by Facebook, but the story was envisioned and provided by the brand. The Intel brand experience enhanced the lives of its users. The discovery mechanism via social media was the distribution strategy, but the real value of the experience was the message (not the medium). "When crafting these experiences, we focus on what is engaging for the audience and present an invitation to participate in an authentic manner," Veneski said. "We also want to ensure that these experiences are compelling enough for our audience to share across their social graph. We do this through an element of unexpectedness that will catch the eye of tastemakers and motivate them to share within their communities of participation." The experience that Intel provided was powerfully personal but on a monster scale. It was the same emotion that someone who cooked a Jell-O recipe in the 1900s felt when making a cookbook-inspired treat. It was the same conversation starter that an episode of "Guiding Light" brought to millions of homemakers. We are in the next stage of the evolution of native advertising. As a marketer, try to harness the power of advertising that doesn't feel like an ad. You have been building this content for years; don't be afraid of a new medium. Today's social media presents you with the personal precision that Jell-O salesmen had in 1906, but also gives you the power of monster distribution, referring more than 2 billion pages in the U.S. alone each month. Embrace this new wave. Tell a story that feels like a story, not an ad. Jack Krawczyk is senior product marketing manager at StumbleUpon. "Woman reading sign" image via Shutterstock.